Human flourishing includes a number of central goods such as friendship with God, friendship with neighbor, understanding of the world, appropriate autonomy, etc. Take any two goods, G and H, other than friendship with God. We could imagine an alien race of intelligent beings that are approximately as capable of humans in terms of goods other than G and H, but that normally are much, much more capable than we in respect of G and much, much less capable than we in respect of H. Maybe these are a race of individualistic scientists and philosophers who are barely capable of friendship with their fellows. Or maybe these are a race of very friendly and socially intertwined beings who are much less good at understanding the world. Call these aliens "xens". There is nothing morally repugnant about xens, in the way that it would be repugnant to imagine a race of beings whose flourishing consists in causing misery to others (if such flourishing is possible). If we ever meet such a race of alien beings, the reaction we should have is "Vive la différence!" We ought not think ourselves superior to them and they ought not think themselves superior to us. But now imagine that there were a form of neurosurgery that greatly increases one's capabilities in respect of G at the cost of one's capabilities in respect of H. It would be clearly wrong to perform this surgery on one's child, and it would be dubious if it were appropriate to have it be performed it on oneself. Why? If the life of the xens is no worse than ours, but merely different, what's wrong with such surgery? I think the obvious answer is: The life of the xens is great--if you're a xen. But we are not xens, and their life isn't for us. For the xens, less of H is normal. For us, less of H is abnormal. So, thinking about xens and neurosurgery suggests we need a notion of normalcy. And this notion had better be morally significant. Merely statistical notions of normalcy lack moral significance. Why be like everyone else? (One might worry that being different from others leads to misery. But I deny this. My childhood was a very happy one, but I was very different from others.) This suggests a natural law intuition: a life with the particular pattern of emphases among pursuits that is characteristic of normal humans is something that has a moral call on us, unlike the pattern of goods embodied in the life of xens. This will be a rather dogmatic post, summarizing a bunch of my thinking about intention and action. I think the fundamental concept in regard to intention isn't the binary relation of x's intending that p (or x's intending to G), but the ternary relation of x's Aing with the intention that p. In other words, intentions qualify actions: "The surgeon is cutting the heart with the intention of healing, while the assassin is cutting the heart with the intention of killing." But isn't it possible just to intend? Maybe, but that's a defective case. Moreover, when you just intend that p, you are still acting—you are trying with the intention that p. Intending in the sense I am after—the sense that occurs in the Principle of Double Effect and that Anscombe is elucidating in Intention—is not the same as wishing, hoping, resolving or planning. We do use the word "intend" in cases of resolve or plan, and I think I can explain that. Start with resolve. When I resolve to A, I am trying to produce a future action. My resolving is an action done with the intention to A later. And so I can be literally said to intend to A. However, sometimes we have something weaker, like a plan. In those cases, I think we are simply extending the word "intend" from the stronger sense to the weaker. This dovetails with Nietzsche's remark that making promises is tied to the great power of controlling our future actions. Plausibly, when I promise to A, I ought to be intending that I will A—a sincere promise, then, is also an attempt to bring about, or at least probabilify, a future action of one's own. But isn't an action caused by its intention? Yes and no. The problem with a simply affirmative answer is that as soon as the intention has occurred, one has already begun to try. Since to begin to try is already to act, on pain of vicious regress it cannot be that every action is caused by an intention. Moreover, when the action goes on to successful fruition, there aren't two actions, a beginning-to-try and the full action. There is just one action which began when one began to try and went on to fruition. But we can temporally subdivide the action, and the temporally later parts of it are caused by the beginning of it. We can, if we like, use "intending" as a stage term, akin to "embryo", for that first part of the action—the beginning-to-try. But just as we should not say that the embryo causes the organism—the embryo, after all, is the organism. [note 1] But of course we can say that the embryo is a cause of the later stages of development, and likewise we can say that the intention is a cause of the later stages of the action. So while the action is not caused by its intention, much of the action is caused by its intention. The intention is an essential part of the action—the rest of the action is not necessary for the action's occurrence though usually necessary for the action's success. This is just as the embryo stage of life is essential to the organism's existence (any horse that came into existence fully-formed, skipping the embryonic stage, would not be Bucephalus), and later stages of life are unnecessary for the organism to have existed, but are necessary for the organism to have successfully matured. This matters ethically. For it lets one hold on to the intuitions that (a) primary moral evaluation is of the intention, (b) the subject matter of moral evaluation is the action, and (c) the success or failure of an action can be morally relevant features. The intention is the essential core of the action, and the primary question whether a person has acted rightly is a question of the evaluation of the intention. But at the same time the success or failure matters morally. One is no better as a person if one's attempt to commit a crime fails, but one is better off morally speaking (for instance, one typically owes less to the prospective victim if one has completely failed). Finally consider Knobe cases. We have the case of the CEO who is told of a possible new programme which will make the company oodles of money. There is one catch—the programme will also harm the environment. The CEO says he doesn't care about the environment, but will go for the program. Most people say that the CEO intentionally harms the environment. Consider, however, this variant question which is tied more closely to what I think is the fundamental ternary nature of intention: Did the CEO go for the programme with the intention of harming the environment? Surely the answer is negative. We can, after all, paraphrase as: Did the CEO go for the programme in order to harm the environment? This suggests (but see also this paper by Wasserman) that we want to distinguish between intentionally Aing and doing something with the intention to A. The concept I am after is that of doing with the intention to A. Once one has an adverbial ontology, like the one I used to help with the Incarnation, one no longer needs the parts of a substance in one's ontology. "I have two hands." That's made true by my being two-handed. "My right hand has five fingers." That's made true by my having a right hand five-fingeredly. More explicitly, there is a mode m in virtue of which I have a right hand. (According to my Incarnation post, I have m indirectly, as m is a mode of my humanity.) Then we have two moves we can make. We could say that there are five modes of m, which each of which is a different way of the hand's being fingered. If we go that route, then we are forced into identity of indiscernibles for fingers, and by extension for any other parts. I welcome that consequence myself, since I'm anyway pulled to identity of indiscernibles by my theory of transworld identity. But alternately we could simply posit a mode of being five-fingered, perhaps a mode relational to the number five. Some properties of wholes are grounded in properties of parts. "I have the property of having heart-beat in virtue of having as a part a heart that in turn has the property of beating." Parts have location and help explain partial location. "I am partly in this room and partly in that, because one of my legs is here and the other there." Some parts are widely thought to be able to move between substances. "Several hours after you ate the apple, a carbon atom that used to be a part of an apple tree has become a part of you." The adverbial mode ontology does the first two tasks well. 1: There is a mode in virtue of having which I have heart-beat. But I have that mode indirectly: that mode modifies my being hearted, which in turn modifies my humanity. So properties are divided up. But an advantage of the mode way is that we get to uniformly divide properties not just by parts, but by functional subsystems. Some functional subsystems correspond to parts, but likely not all. In a computer running several processes at once on the same processor core, the processes may correspond to different functional systems—say, one doing Fourier transforms of microphone data and another watching for user input events—but the processes may be implemented by overlapping sets of physical parts (and a computer has no others), and we could easily imagine that there is no distinct set of parts corresponding to each process. It seems likely that something like that happens in the brain, and even if it does not, the possibility should be accounted for in our ontology. The adverbial mode ontology apportions properties had in virtue of a functional subsystem in the same way that it apportions those properties had in virtue of a physical part, and that strikes me as exactly right. 2: This is really just a special case of 1. "My right leg is located in this room" is true in virtue of my being right-leg-possessed this-roomly. But unless we posit that modes can move between substances—I've heard Rob Koons speculate in that direction and Aquinas's account of transsubstantiation famously allows modes to survive the destruction of their underlying substance—it's harder to handle 3. On general Aristotelian grounds, I think one can just bite the bullet. The identity of a part, if there are parts, is going to be dependent on the whole. There is no carbon atom that was a part of the apple tree and is now a part of you. There are (in the eternalist sense of "are"), at best, two carbon atoms, one that was identity dependent on the tree and the other that is identity dependent on you, and the first caused the second. This is counterintuitive. So what our adverbial ontologists should say about 3 is that the apple tree has some mode m1 that makes it count as having had a certain carbon atom once, and you have some mode m2 that makes you count as having a certain carbon atom. There is a continuity of location (see 2) between the one mode (perhaps with some other intervening modes, depending on the ontological status of the apple as such) and the other. Moreover, m1 is a cause of m2. Or, if we prefer (and I think we should), the apple tree as modified by m1 caused you to have m2. I.e., there is a mode c1 of causation had by m1, which is a causation of m2, or of me as having m2. But the numerical identity of the particles, that we need to give up on. However, since giving up on parts dissolves the problem of material constitution, and since every other solution to the problem of material constitution has something else counterintuitive about it, we are in this regard no worse off here than any view on which there are parts. A challenge for the view is to distinguish between those modes that correspond to parts and those modes that don't. But one might just reject the distinction. Or one might go like this. It might be that all and only the modes that have a location mode are parts. But don't non-part subsystems have a location mode? Maybe not. Rather, they may be modes--or joint modes (maybe a mode can be a mode of more than one mode--or maybe even more than one substance--and maybe that is how relations are to be handled)--of one or more parts, and the parts are what have a location mode. The non-part subsystems, then, have a location in a derivative sense. Consider this Wittgensteinian line of thought about the doctrine of the resurrection of Jesus (similar things can be said about many other doctrines). [note 1] The way to understand what believers say when they confess "Jesus is risen" is to see what role that utterance plays in their lives, both there and then (say, in the liturgy) and more broadly in their lives. Further, the word "risen" in this sense has little currency outside religious contexts, so the notion of a "literal" meaning of the word outside of a religious context is problematic, and hence the role that the utterance plays in lives is determinative for meaning. It is difficult, therefore, to say what the disagreement between literalists and non-literalists about the resurrection is really about. It seems to me that there is a fairly simple response to this line of thought. For the sake of argument, let's take on board the Wittgensteinian assumption that language gets its meaning from use, and hence to examine the meaning of an utterance one must see what role it plays in a life. But we must not forget that a significant part of the role that an utterance plays is found in its inferential connections with other utterances, both deductive and non-deductive. For instance, the utterance "Jesus is risen" provides inferential support (one needs to judge on a case-by-case basis whether it's deductive or not) for such claims as "Jesus is not dead", "Jesus's skeleton isn't presently lying in the earth", "Jesus is alive", "People saw Jesus after his resurrection by means of photons reflected from his body", etc. This inferential support is at least as constitutive of the meaning of the utterance as is, say, the utterance's liturgical role. Moreover, the it is also a part of the role of the utterance that it is (non-deductively) supported by such claims as "Jesus's tomb is empty and his body is nowhere to be found", "Jesus was seen eating fish after he died", "Some of those who report Jesus as being risen knew what Jesus looked like", etc. Perhaps unlike the confession "Jesus is risen", the claims I gave as inferentially connected with this confession make use of ordinary vocabulary and in ordinary ways. These claims are a part of our ordinary non-religious language games. We ask whether someone is alive or dead, whether someone's skeleton is buried in the earth, whether someone's tomb is empty, whether anyone saw someone eating fish, and so on. Now the Wittgensteinian anti-literalist will insist that the inferential connections between "Jesus is risen" and such ordinary claims do not do justice to the religious significance of "Jesus is risen", that for that significance one must pay attention to the liturgical and motivational role of the utterance in the lives of believers, and so on. But the literalist can take all that on board. There is more to the resurrection than is captured by the inferential connections with various ordinary non-religious claims. But there is no less: these inferential connections are an essential part of the constitution of the phrase's meaning, in a way that the non-literalist has a harder time accounting for. What connection, for the anti-literalist, is there between "Jesus is risen" and the fact that some of those who reported seeing Jesus knew what he looked like? But on a literalist reading, the inferential connection is clear. This gives us both a way to characterize the disagreement—the literalist takes such inferential connections with ordinary claims to play a central part in the constitution of the meaning of "Jesus is risen" while the non-literalist does not—and a reason to favor the literalist reading, since the literalist is operating with a fuller collection of data. At the same time, the literalist reading of "Jesus is risen" has significant flexibility, because the inferential connections are often probabilistic. The claim that x is risen makes probable that x was seen by means of photons reflected from x's body. But it does not entail it. It may be that x's body no longer reflects photons or that nobody has seen x. Thus, the literalist need not be committed to the claim that Jesus was seen by means of reflected photons, and might even deny it (there is a strong tradition that Jesus's body had some very special properties) but the literalist does need to see the confession "Jesus is risen" as of such a sort as to make the photonic claim a plausible inference. On an anti-literalist reading, however, the photonic claim does not seem to be a plausible inference. And that favors the literalist. This gives us a literalism without a commitment to any such dubious thing as a "literal meaning". But there is a lesson for the literalist, too. The literalist should not take the meaning of "Jesus is risen" to be exhausted by the inferential connections to ordinary claims. That, too, would be basing the meaning on merely partial data. Christ is God and Christ is a human. God is unchanging and humans are changing. God is omnipresent and humans are spatiotemporally delimited. God is all powerful and the power of humans is limited. All praise be to Christ on this Christmas day! Christ is unchanging, omnipresent and omnipotent as God, but as human he changes, and is limited in presence and power. Such answers do work logically speaking, but it would be good to have a little bit more to say about what the "as" does. Sam is quick as a reader and slow as a runner. Sam reads quickly and runs slowly. No contradiction results from contradictory adverbs being attached to different predicates. From Sam reading quickly we can deduce that Sam does something quickly, but that does not contradict his doing something else slowly. Christ is God unchangingly, omnipresently and omnipotently, but he is human changingly and limitedly in presence and power. So far that's just words. But now make it into ontology. The ontology takes a cue from Spinoza's nesting of modes. (Other philosophers have nested modes, but I think it is only in Spinoza that the nesting is really central.) When Sam reads quickly, there is Sam, who reads, and Sam's reading, which is quick. If Sam reads excessively quickly, there is Sam, who reads, and Sam's reading, which is quick, and the quickness of Sam's reading, which is excessive. All of these, other than Sam himself, are modes (Spinoza wrongly thinks Sam is a mode, too). We can now talk of a mode being directly or indirectly a mode of something. Thus, the quickness of Sam's reading is directly a mode of Sam's reading and indirectly a mode of Sam. The excessiveness of Sam's quickness of reading is directly a mode of Sam's quickness of reading and indirectly a mode of Sam's reading as well as of Sam. Next theorize that a mode m is an essence of an individual x if and only if m is directly a mode of x. This could simply be a necessary "if and only if" or, more ambitiously, it could be an account of what it is to be an essence, essences being nothing but direct modes. Observe that this is a non-modal account of essence—here we are talking of essence in the ancient and medieval sense, not in the modern modal sense (such a distinction was pointed out by Fine, but the best account in print is by Michael Gorman). This account makes it plausible that analogy will be a central concept. Adverbs apply analogically across predicates. The "quickly" in "Sarah runs quickly" and "Sarah thinks quickly" is to be understood analogically. In general, I suspect cross-essence predications are to be understood analogically. That is a Thomistic aspect in the theory. Another Aristotelian aspect is that we can make sense of "necessary accidents". Thus, Aristotle thinks it is an accident of a human that the human have a capacity for laughter, but he also thinks this is a necessary accident—every human necessarily has a capacity for laughter. It is insufficient for a mode to be an essence that the mode is necessary: it must be directly a mode of the individual. But just as it is indirectly a mode of me that I be laughing—I am human laughingly when I laugh (which differs from, say, being an alien or angel laughingly)—it indirectly but necessarily a mode of me that I have a capacity for laughter—I am a human with a capacity for laughter ("with..." is one of the many ways of indicating adverbial modifiers). There is a serious theological difficulty. Does not the account contradict divine simplicity? After all, does not (4) posit a mode of God, namely divinity, and modes of a mode of God, namely omnipresence of divinity, omnipotence of divinity and unchangingness of divinity? Yes, but that only contradicts divine simplicity if these modes are all distinct. But they aren't distinct. Divinity, omnipresence of divinity and all the others are all just God. Thus God is his own mode in this technical vocabulary. But since predication of God is analogical, what this means it that God is related to himself in a way analogical to our relationship to our modes. (Compare: the person who loves herself is related to herself in a way analogical to the way someone who loves another is related to that other.) It's important not to take "mode" to mean "accident", but that was already something necessary from the fact that essences are modes. This reconciliation with divine simplicity does, however, mean that I cannot simply define a substance as something that isn't a mode. For God on this reconciliation is a substance and a mode. (And that is Thomistic, too, though the vocabulary of "mode" is not. God is both substance and that substance's pure act.) We might define a substance as something that isn't a mode of anything else. Or we might say that x is a substance if and only if the proposition that x exists has a truthmaker which is x and has no other truthmaker. Finally, I leave it as an exercise to the reader to extend my "metaphysically Aristotelian quantification" to this context. At the same time, some of my cross-level uses of "is" in this post will need some charitable analogical reading. Imitation is a kind of reflection, and reflection seems to introduce a new symmetry into the world. Symmetry has value, aesthetic value. Therefore imitation seems to introduce value. Plato thought that the value of an imitation was derivative from the value of what was imitated. That may be true if one considers the imitation in and of itself. If the water is perfectly still, an ugly building will have an ugly reflection (if the water is not perfectly still, the natural beauty of the water may improve on the building). But when one considers the imitation together with the imitated, the resultant symmetry can produce new, additional beauty. The kaleidoscope is the most obvious example, where beauty arises by reflection from a jumble of shapes. Thus the revelation of ugliness, as in Picasso's Guernica, when taken together with the horror that it reflects is a greater whole with a kind of grim beauty of symmetry. This kind of symmetry is a case of truth. 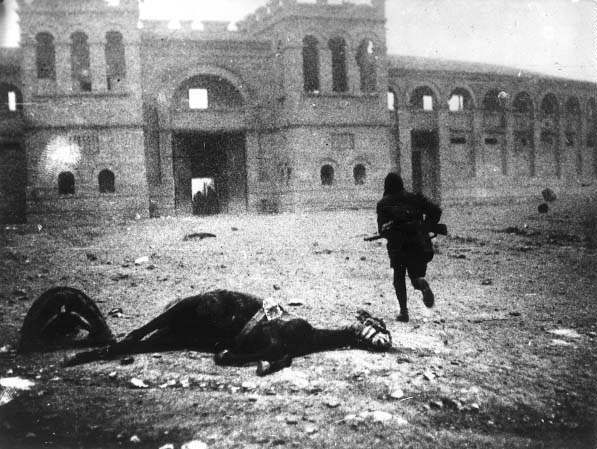 It is aesthetically crucial for Guernica that the horrors it reflects are real. Truth can have a beauty to it when it is a form of symmetry. Thus at least sometimes we should take truth to correspond to reality. Symmetry, thus, is one way in which the bad and the ugly can become a constituent part of a good, a good that defeats the ugly and moves in the direction of defeating the bad. Justice, in fitting reward and punishment, provides a further symmetry, a symmetry that also exhibits the aesthetic value of symmetry--we admire this aesthetic value when enjoy works of literature and film that exhibit poetic justice. But justice has a value going beyond the aesthetic, as surely does truth. The above show how one can derive an aesthetic value in imitation from the value of symmetry. One could try to run the derivation in the opposite direction. Could symmetry just be a form of imitation, and hence take its value from imitation? First of all, only non-naturalists like theists and Platonists can say this, because a "chance" arrangement of pebbles can exhibit a genuinely beautiful symmetry without there being any imitation there. The theist can say that Providence is behind the chance arrangement, and hence each symmetric segment of the arrangement can be imitating God in an infinitely imperfect way, while the Platonist can say that both symmetric segments reflect some Form. But this would put the imitation in the wrong place. For in the "chance" symmetric arrangement, what is beautiful is not just that each symmetric segment imitates God or the Forms, but that they are symmetric to one another. This symmetry is not just a mirroring, because mirroring has an essential distinction between the mirror image and reality, with the reality being explanatorily prior, while the segments of an artistically planned symmetric arrangement do not need to have one of them be explanatorily prior to the others. But, nonetheless, the theist needs to affirm that there is a value in imitation that does not come from the value of symmetry and, further, that there can be cases where imitation has no value of symmetry. For all creation imitates God, but it does not thereby produce a greater God-and-creation whole (even an ontologically innocent) that exhibits the value of symmetry. For nothing can add anything to God. There is no holistic value of which God is component. God perfectly exhibits the symmetry of three Persons with precisely one essence, and creation's imperfect imitation adds nothing to this perfection. There is no new valuable symmetry of "God and creation". Thus while symmetry is valuable in and of itself, imitation can have a value over and beyond the value of symmetry: the imitation of God only highlights the infinite gulf between God and creation rather than creating symmetry. And so we come back to seeing that Plato may have been right. The value (aesthetic and otherwise) of the imitation qua imitation, rather than of the imitation qua producer of symmetry, depends on the value of what is being imitated. Creation as imitation of God exhibits that value, but does not as imitation of God exhibit the value of symmetry. On the other hand, Guernica has no additional value of imitation qua imitation beyond symmetry, since the horrors of war that are being imitated are ugly and evil. But at the same time, revelatory imitation of evil can have an additional value qua revelatory, namely the value of truth. Thus, while there is a tie between imitation and symmetry, and within creation imitation produces a kind of symmetry, we should not derive the value of imitation from that of symmetry nor that of symmetry from that of imitation. Likewise, truth and retributive justice have values independent of symmetry, though truth about creatures and retribution, whether positive or negative, to creatures seems to always exhibit the value of symmetry as well. Yesterday, I overheard my six-year-old son Dominic saying in another room "... because the world is not in the world." In later conversation, he told me what the conclusion of the argument was: "The world isn't the biggest thing in the world." If Dominic is right that the world is not in the world, then on Lewis's semantics the worlds are not possible entities and in particular are not possible worlds. For on Lewis's semantics, something is possible provided it exists in some world. I was removing my son's band-aid, and in so doing I was hurting him. Half way through, I had a brilliant idea. I went to the kitchen, soaked a bit of paper towel in vegetable oil and applied the vegetable oil where the band-aid was separating from the skin as I peeled the band-aid. Result: the band-aid separated with much less pain, as the vegetable oil dissolved the adhesive. Obviously, it's not a good idea if there is an open wound. And one has to clean off the vegetable oil, perhaps with a bit of soap. I got the idea from the fact that one can remove self-adhesive stickers with vegetable oil. (I used to use WD-40 and then discovered that vegetable oil works at least almost as well.) A later web search showed that other people discovered both uses for vegetable oil (e.g., see here). Anyway, I'm posting this here in the interests of decreasing the amount of minor evils in the world. We've acquired a Kindle Fire. I've been trying it out. I like the screen. The size is slightly too large to be comfortable in a front pants pocket, but I could imagine keeping it there. I think it's a pretty nice tablet. Web browsing speed is decent. Video playing is good. Scrolling through moon maps works well. But it is a Kindle, after all, so one would expect its core functionality would be reading Kindle books. And that doesn't work so well. Here are a few problems, though maybe I just haven't figured things out. The good news is that all of these are software issues and hence Amazon can fix them if they want to. Moreover, third-party ebook reader apps will fix some of these, but they won't read the Kindle books. 1. No global search. One of the cool things about the eink Kindles is supposed to be indexed global text searching, so you can search through all your books at once, fast. No such thing. There is a search button when you go to Books, but it just searches titles and authors (and maybe some other meta-data). It doesn't look inside books. (And, yes, it's had plenty of time to index at least the dictionary that's there. 2. Super slow search within a book. Searching is the big advantage of an ebook reader over physical books. Without searching, an ebook reader is mainly a matter of convenience. With searching you can do new and intellectually useful things with your books. The eink Kindles (I am now tempted to say "real Kindles") index books and have super-fast searching within them. While the Fire does search within a book, it's super slow. For instance, I did my usual benchmark search for "junk" in my Kindle version of Aquinas's Summa. For comparison, on my aging Palm TX with Plucker, the search takes about 45 seconds. On the Fire it took about 4 minutes 35 seconds. The Fire is on a dual-core 1GHz device. The Palm TX is a 300MHz device, and the search is not index-accelerated. Without indexing, a decent developer should be able to get under a 30 second search time, and with indexing it should be instant. 3. Inconvenient installation of books not from Amazon. I tried to download my etext of the Summa from the Internet. It's in the proper .mobi format. Amazon's web browser duly saved it but did not recognize the .mobi extension, and offered to open it in QuickOffice rather than the Kindle reader. To open it in the Kindle reader, I had to move it to the Books folder. One could do that with a file manager app (I don't think one is included), but I just did it via a USB connection to a laptop. Then it opened fine. But why doesn't the Kindle's browser recognize Kindle files? 4. The minimum screen backlight level is set too bright, making reading in a dark room not quite as comfortable as it could, and also not so great for astronomy. To give Amazon credit, it's not much too high, and it's a problem on most Android devices. This is a software problem--the hardware is quite capable of lower backlight levels. Fortunately, I'm almost finished a (non-free) app that fix this issue. (I speculate that this is done in order to avoid customer service headaches from users who set their brightness too low and then don't know how to set it back.) I love ebook reading with a backlit display, but I like the backlight to be dim. Update: The 6.3 update greatly improves the minimum backlight level. 5. Text rendering in the Kindle ebook viewer app leaves colorful shadows around letters in portrait, reverse portrait and reverse landscape mode. (The same problem occurs in the regular Kindle app for other Android devices.) The problem doesn't seem to occur in other apps on the Fire. There are anecdotal reports of eyestrain, but I don't know if they are related. The cause of the issue is that for better text quality, Amazon enabled subpixel rendering in the ebook viewer. Subpixel rendering uses the red, green and blue rectangles that each pixel is striped into to increase the effective screen resolution. But to do that, you need to know how the red, green and blue rectangles are arranged, and you need to change your rendering when the screen is rotated by the user. Otherwise, you get colorful shadows, and you'd be much better off using gray-scale antialiasing. However, the ebook reader app does subpixel rendering on the assumption of horizontal RGB ordering no matter how the screen is turned. While the shadows are visible to the naked eye, I verified them under a microscope. See the photos on the side (the slanted line is the pointer in the eyepiece). Their assumption of horizontal RGB striping produces beautiful results in regular landscape mode (landscape with power button on right) where the assumption is correct. Notice how nice the Landscape letters look with no color shadows. But in all other modes, the results are terrible. 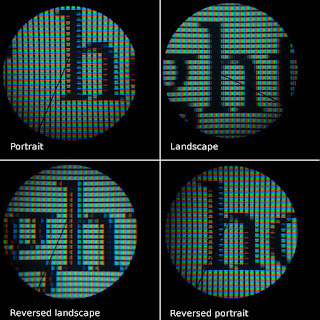 The worst of all is reversed landscape (landscape with power button on left): you can see a nasty red shadow on the left of the long vertical of the "h" and a nasty blue shadow on the right. Portrait and reversed portrait aren't quite so terrible, but are pretty bad (and I think especially bad if you turn on night mode and look at white text on a black background). 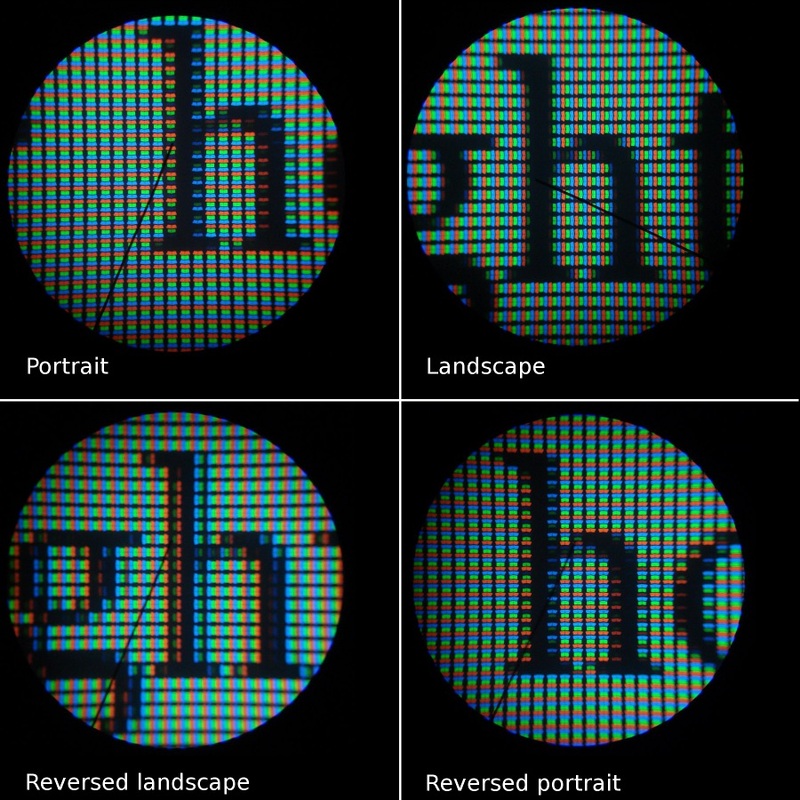 You can see that the portrait and reversed portrait "h" has the red and green subpixels turned on and the blue subpixels muted on the left of the long vertical stroke, which results in an orange shadow. This works perfectly in the landscape "h" where the darkened blue subpixel merges visually into the vertical and the red and green ones merge into the white beside it, and that was the assumption on which the font renderer was working. Points 3, 4 and 5 are all easy fixes if Amazon only wants to. The subpixel bug can be fixed by just turning off subpixel rendering--less than a minute's work for their developer. The text will still be of great quality, as one can see in other apps. The inconvenient sideloading of books is an easy fix, ten minutes' work for a developer, but I can see that Amazon might have commercial reasons for not doing it. The minimum brightness is another minute's work for their developer. A good search would take a bit longer. I'm guessing about 15 hours of developer time to get a polished and fully debugged good search. The cost of all of this would be miniscule to Amazon. Take regularity as the thesis that the rational agent assigns a probability of 0 only to impossible propositions and a probability of 1 only to necessary propositions. Bayesians like regularity in large part because regularity allows them to prove convergence theorems. These convergence theorems say that if if you start with a regular probability assignment, and keep on gathering evidence, your probability assignments will converge to the truth. Here, a probability assignment for p "converges to the truth" provided that if p is true, then one's credences converge to 1, and if p is false, then one's credences converge to 0. But they cannot use this argument for regularity. For consider the proposition Cp: "If you keep on gathering evidence in manner M, your probability assignment for p will converge to the truth" (take that as a material conditional). The kinds of convergence theorems that the Bayesians like in fact show that P(Cp)=1. [note 1] And that's why the Bayesians like these theorems. They give us confidence of convergence. But now notice that these very convergence theorems are incompatible with regularity. For it is clear that Cp is not a necessary truth. Just as it is possible to get an infinite run of heads (it's no less likely than any other infinite sequence) when tossing a coin, it's possible to have an infinite run of misleading evidence. In summary, one of the main reasons Bayesians like regularity is that it yields convergence theorems. But the convergence theorems are not compatible with regularity. Ooops. Not only do the convergence theorems refute regularity, but they are supposed to be the main motivation of regularity. In email discussion, a colleague from another institution suggested that the regularist Bayesian might instead try to assign probability 1−e to Cp where e is an infitesimal. I don't have a proof that that can't work for the particular convergence theorems they're using, but I can show that that won't work for the strong Law of Large Numbers, and since the convergence theorems they're using are akin to the strong Law of Large Numbers, I don't hold out much hope for this here. Janet Smith has written a reply to my and Chris Tollefsen's critique of her defense of lying in some circumstances. There is a discussion on the First Things page, though I shouldn't contribute further, being all out of time. Finding something funny always involves being surprised. An omniscient being is never surprised. So, an omniscient being finds nothing funny. One might further conclude from this that the funny is not an absolute and objective category. But in fact premise (1) seems false and it is not clear that premise (2) is true. Premise (1) seems false: Consider the phenomenon of the person who is bad at telling jokes, because the closer he gets to the punchline, the harder it is for him to keep from laughing (that's me!). Such an annoying person obviously finds the joke funny, even if he's told it many times and it appears is not at all surprised. Some sort of thwarting of prima facie reasonable expectations may be an essential feature of finding something funny, but such thwarting can happen without surprise, and could well happen eternally and unchangingly. Interestingly, I don't know if I get to beat up on both premises (1) and (2). For if there is such a possibility as eternal surprise, then maybe the person who can't stop laughing while telling a joke is simply always surprised by it. Hence, it may be that one of (1) and (2) is true. But at most one, and the argument needs both. There may be other arguments why an omniscient being couldn't find anything funny. But the one I started with fails. Spinoza's main theory of intentionality is simple. What is the relationship between an idea and what it represents? Identity. An idea is, simply, identical with its ideatum. What saves this from being a complete idealism is that Spinoza has a two-attribute theory to go with it. Thus, an idea is considered under the attribute of thought, while its ideatum is, often, considered under the attribute of extension. Thus, the idea of my body is identical with my body, but when we talk of the "idea" we are conceiving it under the attribute of thought, and when we talk of "body" we are conceiving it under the attribute of extension. But there is both a philosophical and a textual problem for this, and that is the problem of how false ideas are possible. Since presumably an idea is true if and only if what it represents exists, and an idea represents its ideatum, and its ideatum is identical with it, there are no false ideas, it seems. The philosophical problem is that there obviously are! The textual problem is that Spinoza says that there are, and he even gives an account of how they arise. They arise always by privation, by incompleteness. Thus, to use one of Spinoza's favorite examples, consider Sam who takes, on perceptual grounds, the sun to be 200 feet away. Sam has the idea of the sun impressing itself on his perceptual faculties as if it were 200 feet away, but lacks the idea that qualifies this as a mere perception. When we go wrong, our ideas are incomplete by missing a qualification. It is important metaphysically and ethically to Spinoza that error have such a privative explanation. But at the same time, this whole story does not fit with the identity theory of representation. Sam's idea is identical with its ideatum. It is, granted, confused, which for Spinoza basically means that it is abstracted, unspecific, like a big disjunction (the sun actually being 200 feet away and so looking or the sun actually being 201 feet away and looking 200 feet away or ...). When an idea i is unspecific, then it loosely represents the ideatum of the idea i* that is the relevant specification of i when there is a relevant specification of i. When there is no relevant specification of i, then i does not loosely represent anything. Here, we may want to allow an idea to count as its own specification—that will be an improper specification. When an idea is its own relevant specification, then the idea loosely represents the same thing as it strictly represents, and it must be true. I am not sure Spinoza would allow a confused idea to do that. If he doesn't, then we have to say that specification must be proper specification—the specifying idea must be more specific than what it specifies, it must be a proper determinate of the determinable corresponding to the unspecific idea i. An idea, then, is loosely true provided that it loosely represents something. Otherwise, it is loosely false. Error is now possible. For there may not exist an actual relevant specifying idea. Or, to put it possibilistically, the relevant specification may be a non-actual idea. What remains is to say what the relevant specification is. Here I can only speculate. Here are two options. I am not proposing either one as what Spinoza might accept, but they give the flavor of the sorts of accounts of relevance that one might give. A specification i* of i is relevant provided that the agent acts as if her idea i were understood as i*. A specification i* of i is relevant provided that most of the time when the agent has had an idea relevantly like i the ideatum of an idea relevantly like i* exists (i.e., an idea relevantly like i* exists), and there is no more specific idea than i* that satisfies this criterion (or no more specific idea than i* satisfies this criterion unless it is significantly more gerrymandered than i*?). I think Spinoza would be worried in (1) about the idea of acting as if a non-existent idea were believed. This is maybe more Wittgensteinian than Spinozistic. I think (2) isn't very alien to Spinoza, given what he says about habituation. Loose truth and loose representation may be vague in ways that strict truth and strict representation are not. The vagueness would come from the account of relevant specification. I don't know that Spinoza had a view like I sketch above. But I think it is compatible with much of what he says, and would let him hold on to the insight that fundamental intentionality is secured by identity, while allowing him to say that privation makes error possible by opening up the way for ideas which are sufficiently inspecific in such a way that they have no correct relevant specification. I ask you to give me an estimate of how long a table is. You say "950 mm". What did you do? You didn't assert that the table was 950 mm. Did you assert that you estimated the table at 950 mm? Maybe, but I think that's not quite right. After all, you might not have yourself estimated the table at 950 mm—you might have gone from your memory of what someone else said about it. So are you asserting that someone has estimated the table at 950 mm? No. For if someone had estimated the table at 700 mm and you could see that it wasn't (relevantly) near that, it wouldn't be very good for you to answer "700 mm", though it would be true that someone has estimated the table at 700 mm. Maybe you 're saying that the best estimate you know of is 950 mm. But that's not right either, because the best estimate you know of might be 950.1 mm. Here is a suggestion. Giving an estimate is a speech act not reducible to the assertion of a proposition. It has its own norms, set by the context. The norm of assertion is truth (dogmatic claim): it is binary. But the norm of an estimate is not a binary yes/no norm as for assertion, but it can often be thought of as a continuous quality function. The quality function is defined by what it is that we are estimating and the context of estimation (purposes, etc.) Typically, the quality function is a Gaussian centered on the true value, with the Gaussian being wider when less precision is required. But it's not always a Gaussian. There are times when one has a lot more tolerance on one side of the value to be estimated—where it is important not to underestimate (say, the strain under which a bolt will be) but little harm in overestimating by a bit. In such cases, we will have an asymmetrical quality function. (This is also important for answering the puzzles here.) So in giving an estimate one engages in an act governed by a norm to give a higher quality result—but with a defeasibility: brevity can count against quality (so, you can say "950 mm" even if "950.1 mm" has slightly higher quality). The second and third items can be subsumed as "the relevant bits of the extra-linguistic world". So, here's a very abstract theory of estimates. Estimating is a language game one plays where the quality function keeps score. When one is asked for an estimate (or offers it of one's own accord), the context c sets up a function qc from pairs <x,w> to values, and one's score in the game is qc(x,@) where x is the value one gives and @ is the actual world. Notice that this is general enough to encompass all sorts of other language games. For instance, the quantities need not be numbers. They might be propositions, names, etc. Assertion is a special case where the quantities are propositions, and qc(x,w) is "acceptable" when x is true at w and is "unacceptable" otherwise. Or consider the game initiated by this request: "Give me any approximate upper bound for the number of people coming to the wedding." The quality function qc(x,w) is non-decreasing in x: Because of the "any", saying "a googol" is just as good as saying "101", as long as both are actually upper bounds. Thus qc(x,w) is "perfect" in any world w where no more than x people come to the wedding. In worlds w where more than x people come to the wedding, qc(x,w) quickly drops off as x goes below the actual number of people coming to the wedding. "Quantities" can be anything. They might be abstracta or they might be linguistic tokens. It doesn't matter for my purposes. Likewise, the values given out by the quality function could be numbers, utilities, or just labels like "perfect", "acceptable" and "unacceptable". Conjecture: Assertoric use of sentences with vague predicates is not the assertion of a proposition but it is the offering of an estimate. For instance, take as your quantities "yes" and "no", and suppose the context is where we're asked if Fred is bald. Then the quality function will be something like this: qc("yes",w) is less in those worlds w where Fred has more hair, and qc("no",w) is more in those worlds where Fred has less hair. Moreover, qc("yes",w) is "perfect" in worlds where Fred has no hair. What if I am not asked a question, but I just say "Fred is bald"? The same applies. My saying is not an assertion. It is, rather, the offering of an estimate. We can take the quantities to be binary—say, "Fred is bald" and "Fred is non-bald"—but the quality function is non-binary. The rules may actually differ from context to context. That's fine, because this is not logic per se: this is the evaluation of quality (and that's how this approach differs from non-classical logic approaches to vagueness—maybe not formally, but in interpretation). Moreover, there may in some contexts be no assigned quality value to a particular sentence. Again, that's fine: there can be games with underdetermined rules. In a nutshell: A vague sentence is an estimate of how the world is. Such sentences are not to be scored on their truth or falsity, but on the quality of the estimate. A brick did not causelessly come into existence in front of me over the past five minutes. A frog did not causelessly come into existence in front of me over the past five minutes. A golden icosahedron did not causelessly come into existence in front of me over the past five minutes. A platinum sphere did not causelessly come into existence in front of me over the past five minutes. Each of these phenomena lacks an explanation if the Principle of Sufficient Reason is false. This means that it is going to be hard for an opponent of the Principle to defend any claim that the Principle of Sufficient Reason is likely to hold in any given case. If we are to define a vague term, the definiens will need to be vague in exactly the same way as the definiendum is. But it is exceedingly improbable that the contextual profile of the vagueness of the definiens would exactly match the contextual profile of any complex definiendum that we could practically state, or maybe even that we could state in principle. For instance, suppose we're trying to define "short". Now, "short" has a certain contextual vagueness profile which specifies, perhaps vaguely, in what context what lengths do and do not count as short and in what way, Either there is vagueness all the way up or at some level we get definiteness. Suppose first that at some level we get definiteness. For simplicity, suppose it's after the first level of vagueness. Then for any context C, there will be precise lengths x1 and x2 such that anything shorter than x1 is definitely short, anything of length between x1 and x2 is vaguely short, and anything longer than x2 is definitely non-short. These precise lengths will be some exact real numbers determined by our actual linguistic practices—which things we've called "short" and which we haven't. It is exceedingly unlikely that we could construct a definiendum which will make the definitely/vaguely/definitely-not transitions in exactly the same spot. Suppose, for instance, we define "is short" as "has small length." Well, small will have its own vagueness profile, defined by a different set of social practices. It is exceedingly unlikely that this vagueness profile would exactly correspond to that of "is short", so that the exact point of transition between being definitely short and vaguely short should be the point of transition between being definitely of small length and being vaguely of small length. Suppose now that we have vagueness all the way up. Then we're going to have arbitrarily long predications like "a is vaguely definitely vaguely vaguely vaguely definitely definitely vaguely definitely short." And which such predications apply to which objects will be determined by our complex linguistic practices surrounding "is short". It is, again, exceedingly unlikely that our complex linguistic practices surrounding some other term, like "has small length" would in every context match those of "is short". For exactly the same reason, except when the users of one language self-consciously use a term as an exact translation of a term used by another language, it is exceedingly unlikely that we could find an exact simple translation of a vague term from one language to another, and for the same reasons as above, a complex translation is also unlikely. For we would have to exactly match the vagueness profile, and since the social practices underlying the different languages are subtly and unsubtly different, it is very unlikely we would succeed. It may be worse than that. It may well be that no two people have the same vagueness profile in their homophonic terms, except when both defer in their usage to exactly the same community. And they rarely do. In practice, when translating and giving dictionary definitions, we are satisfied with significant similarity between vagueness profiles. If you order the people by time of conception, the sequence looks like this: 99 people who will die of cancer, then one person who won't, then 99 people who will die of cancer, then one person who won't, and so on. If you order the people by distance of conception from the center of the universe, the sequence looks like this: 99 people who won't die of cancer, then one person who will, then 99 people who won't, then one who will, and so on. This is a consistent set of information. Question: What probability should you assign to the hypothesis that you will die of cancer? If you just had (1), you'd probably say: 99%. If you just had (2), you'd probably say 1%. So, do we just average these and say 50%? Now imagine you just have (1), and no information about how things look when ordered by distance of conception from the center of the universe. Then you know that there are infinitely many ways of imposing an ordering on the people in the universe. Further, you know that among these infinitely many ways of imposing an ordering on the people in the universe, there are just as many where the sequence looks like the one in (2) as there are ones where the sequence looks like in (1). Why should the ordering by time of conception take priority over all of these other orderings? An obvious answer is that the ordering in (1) is more natural, less gerrymandered, than most of the infinitely many orderings you can impose on the set of all people. But I wonder why naturalness matters for probabilities. Suppose there are presently infinitely many people in the universe and when you order them by present distance from the center of the universe, you get the sequence in (1). That seems a fairly natural ordering, though maybe a bit less so than the pure time-of-conception ordering. But now imagine a different world where the very same people, with the very same cancer outcomes, are differently arranged in respect of distance from the center of the universe, so you get the sequence in (2). Why should the probabilities of death by cancer be different between these two worlds? Dig heels in and insist that the natural orderings count for more. And where results with several natural orderings conflict, you do a weighted average, weighted by naturalness. And ignore worries about worlds where things are rearranged. Deny that there could be infinitely many people in the world, even successively, perhaps by denying the possibility of an infinite past, a simultaneous infinity and the reality of the future. Deny that probabilities can be assigned in cases where the relevant sample-space is countably infinite and there are infinitely many cases in each class. I find (4) implausible. That leaves (3) and (5). I don't know which one is better. I worry about (3)—I don't know if it's defensible or not. Now, if (5) is the only option left, then I think we get the interesting result that if we live in an infinite multiverse, we can't do statistical scientific work. But since statistical work is essential to science, it follows that if we live in an infinite multiverse, science is undercut. And hence one cannot rationally infer that we lie in an infinite multiverse on scientific grounds. The question may be asked: "What if a man could by deception free himself from imminent danger of death? Would not consideration for the preservation of his own being be decisive in persuading him to deceive?" I reply in the same way, that if reason urges this, it does so for all men; and thus reason urges men in general to join forces and to have common laws only with deceitful intention; that is, in effect, to have no laws in common at all, which is absurd. This not only agrees exactly with Kant's position that lying is always wrong, but the form of reasoning is rather Kantian. So the first form of the Categorical Imperative precedes Kant not just in doctrine but also in rationale: if reason tells me to do something, it tells everyone this. And, while I agree the conclusion that lying is always wrong is correct, Spinoza's version of the reasoning just doesn't work. For defender of lying to save innocent life does not say that reason says that one ought always deceive or even that one ought deceive whenever it is to one's advantage, but the claim is more narrow, say that one should lie to unjust aggressors in order to protect their victims. And the universalization of this narrow claim does not lead to the sort of absurd social situation Spinoza points out, though it leads to the kind of contradiction that Kant is worried about: if everyone lied to unjust aggressors when this would save lives, unjust aggressors wouldn't believe the claims of those who speak to them, and there would be no point to the lie. That said, I am in general kind of dubious of universalization arguments. There is, after all, the classic example of playing tennis Saturday night because the courts are free. The theory consists of two theses and two definitions. I will use → for indicative conditionals. And all my disjunctions will be inclusive. MatCond: "p→q" expresses the same proposition as "~p or q". NonTriv: A use of "p→q" normally implicates that "~p or q" is an evidentially non-trivial disjunction for the speaker. Definition: "a or b" is an evidentially non-trivial disjunction for an agent x if and only if x has non-negligible evidence for the disjunction that goes over and beyond evidence for ~p and evidence for q.
I don't here commit to any particular view of evidence, and if there are non-evidential justifications, one can probably easily modify the theory. Here is an interesting consequence of the theory which I think is just right. When my evidence that at least one of ~p and q is true is simply the evidence for ~p (or for q), I don't get to say "If p, then q." But if I tell you that at least one of ~p and q is true, then normally you get to say "If p, then q". For when I tell you that at least one of ~p and q is true, then "~p or q" comes to be an evidentially non-trivial disjunction for you: my testimony is evidence for the disjunction and this evidence does not derive for you from evidence for the one or the other disjunct. If the president will invite me for dinner tonight, I will have dinner with the president in my pajamas. If the sentence on the first piece of paper is true, the sentence on the second piece of paper is true. So, if the president will invite me for dinner tonight, I will have dinner with the president in my pajamas. is epistemically non-trivial. But in normal circumstances, (7) is epistemically trivial, since my only evidence for (7) is evidence for the first disjunct. A similar kind of epistemic backstory can be given for any of the standard paradoxes of material implication, thereby turning paradoxical sentences into non-paradoxical ones (cf. this post). Our Gricean theory (1)-(3) explains this phenomenon neatly. So do theories on which indicatives are non-cognitive and ones on which they are subjective. But the Gricean theory is, I think, simpler. Notice that in this Gricean theory we haven't brought in non-material conditionals through any back door, because we have explained the implicated content entirely in terms of disjunctions. Furthermore, (2) is basically a consequence of (1) plus the very plausible claim that disjunctive sentences normally implicate the epistemic non-triviality of the disjunction. (c) Q and S are incompatible. A and B are incompatible and x's reasons favored A with strength at least SA and favored B with strength at most SB. A and B are incompatible and x's reasons favored A with strength at most SA and favored B with strength at least SB. |up> and |down> are incompatible and the electron's state contained at least proportion 2-1/2 of |up> and at most 2-1/2 of |down>. This is an explanation why the electron collapsed to |up> and not to |down>, and it could not explain why the electron went to |down>. (b') P&(Q or S) entails Q&~S. which does look like a fairly natural weakening of (b'). In other words, we switch from the requirement that the explanation entail which of the alternatives should happen to the requirement that the explanation could only explain one of the two alternatives. Here's a rough start of a theory of non-triviality of conditionals. A material conditional "if p then q" is trivially true provided that (a) the only reason that it is true is that p is false or (b) the only reason that it is true is that q is true or (c) the only reasons that it is true are that p and q are true. A subjunctive conditional "p □→ q" is trivially true provided that (a) the only reason that it is true is that p and q are both true or (b) the only reason that it is true is that p is impossible or (c) the only reason that it is true is that q is necessary or (d) the only reasons that it is true are that p is impossible and q is necessary. For instance, "If it is now snowing in Anchorage, then it is now snowing in the Sahara" understood as a material conditional is trivially true, because the falsity of the antecedent (I just checked!) is the only reason for the conditional to be true. The contrapositive "If it not now snowing in the Sahara, then it is not now snowing in Anchorage" is trivially true, since it is true only because of the truth of the consequent. On the other hand, "If I am going to meet the Queen for dinner tonight, I will wear a suit" is non-trivially true. It is true not just because its antecedent is false--there is another explanation. Likewise, "Were horses reptiles, then Fermat's Last Theorem would be false" and "Were Fermat's Last Theorem false, horses would be mammals" are "Were I writing this, it would not be snowing in Anchorage" are trivially true, in virtue of impossibility of antecedent, necessity of consequent and truth of antecedent and consequent, respectively. But "Were horses reptiles, either donkeys would be reptiles or there would no mules" is non-trivally true--there is another explanation of its truth besides the impossibility of antecedent, namely that reptiles can't breed with mammals and mules are the offspring of horses and donkeys. Omnirationality is the divine attribute in virtue of which when God does A, he does it for all the non-preempted reasons that in fact favor his doing A. (Here is an example of a reason preempted by a higher order reason: God promises me that as a punishment, he won't hear my prayers for the next hour; then that I ask God for something creates a preempted reason for him.) He does not choose only some of the relevant reasons and act on those, in the way a human being might. One consequence of omnirationality is that when I pray for an event F, and F is good and in fact takes place, then I can safely conclude that F took place in part as a result of prayer. For a request is always a good reason to do something good, and while in principle the reason could be preempted, in fact it seems very unlikely that there was a preempting reason in this case. At this same time, in this case we cannot say that the good took place entirely as a result of prayer, because the very fact that it was a good was also, presumably, a non-preempted reason for God to bring it about. Here is another example. Suppose Job leads a virtuous life in such a way that there is good reason for Job to have good things bestowed on him as a reward for the virtuous life. And suppose that, in fact, good things befall Job. Then we can confidently say that they befell Job in part in order to reward Job. For by hypothesis, God has a reason (not a conclusive one, as we learn from the Book of Job!) to bless Job, and the reason seems unlikely to be preempted, so when he blesses Job, he does so in part because it rewards Job. The flip side of this is that, by omnirationality, if a sinner who has not been forgiven for a sin has a bad thing happen to her whose magnitude is not disproportionate to the sin, that bad thing happens to her at least in part as a divine punishment, unless some sort of preemption applies, since God has a reason to punish. Forgiveness, of course, would preempt. But I assumed here the sin was unforgiven. Maybe one could claim that the redemptive events of the New Testament changed everything, preempting all of God's reasons to punish, but that does not seem to be the message of the New Testament. It really does seem that God's reasons to punish unforgiven sin are not preempted even in New Testament times. This does not, of course, mean that all evils that happen to people are best seen as divine punishments. First of all, forgiveness of a sin preempts, and probably annuls, the reasons of justice. Second, even when the justice of the matter is a non-preempted reason for God to allow the evil to befall, it need not be the most important one. God's desire to use the evil to reform the sinner or to glorify himself in a deeper way, may be a more important reason, sometimes to the point where it would be misleading, and maybe even false, to say that the evil befell because the person sinned—we could only say that the evil befell in small part because the person sinned. Finally, as Jesus himself warns, that an evil befalls A and does not befall B does not imply that A was more worthy of the evil than B. For God may have had many additional reasons for allowing the evil to befall A and keeping it from B besides the merits of the wo. We can try to probe more deeply by asking counterfactual questions: Would God still have had the evil befall A had A not sinned? But I think such counterfactual questions tend not to have answers.